No road is perfectly smooth. Even the best maintained roads have imperfections, bumps, cracks, and even potholes. 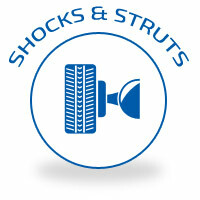 That’s why your vehicle comes equipped with shocks and struts! Shock absorbers keep your vehicle from bouncing up and down as your tires drive along uneven roads. But if your shock absorbers become worn or broken, you’ll immediately notice every small bump and jar while driving along seemingly smooth roads. If left unattended, problems with your vehicle shocks and struts can cause further and costly damage to the suspension system. The increased impact from the road will also cause your tires to wear unevenly, causing bald spots that reduce the life of your tires. You’ll need to replace the tires prematurely, an expense that could have been avoided for several months. Vehicle manufacturers often recommend replacing shocks and struts at 50,000 miles (check your owner’s manual or call Melton Automotive at 205.663.6088 for the exact recommendation for your vehicle). Our experienced technicians recommend having all four replaced at the same time for optimum performance. (If this isn’t an option for you, we’ll help you determine the best alternative, like replacing either front or rear first). If you notice every bump on the road or are approaching the recommended mileage, come to Melton Automotive! Our independent auto shop in Alabaster, AL, uses only the best shocks and struts for reliable repair and performance for your vehicle, including heavy-duty shocks for your truck, SUV, towing, and hauling vehicles. Call for more information or to schedule your next appointment: 205.663.6088.